You don’t need a lot of space to grow passion flowers, unless you grow a lot of them. Gustavo Morales grows a lot of them. I came across Gustavo looking for Passiflora seeds. I am one of those people that doesn’t need a lot of space to grow them, because - well, frankly - I don’t have a lot of space. I wanted to try growing some of the smaller species in pots, so I called Colombian passion flower expert, Dr. John Ocampo, who had recently finished a great illustrated guide to the country’s Passiflora species to inquire about people that might grow these plants locally. He gave me Gustavo’s phone number and a few days later I was driving to the outskirts of Bogotá to meet him. “Somebody has to grow them”, he greeted me. “Otherwise a couple of species will be out of luck in no time”. Gustavo is an exceptional botanist who has spent most of his life enriching the knowledge of Colombian flora. He has constantly fought for the conservation of local plant resources, especially the country’s rich passion flower and Heliconia diversity. He calls things by their name, and, contrary to many of his colleagues, he actually grows the plants he works with. He is the curator of several live plant collections at various botanical gardens in Colombia and is referred to as “El Profesor” wherever he has worked. And while Colombia has a lot of talented botanists, there are but a few interested in the horticulture of the groups that fall within the area of their expertise. Fisheye view of “El Profesor”, Gustavo Morales, admiring one of his formidable and beautifully-grown Passiflora parritae accessions. My first meeting with him was unusual, in the sense that we had no real conversation. He walked at a fast pace through his diverse botanical collection located in a cool wet forested plot at 8,500’/2,600 m, rattling through both taxonomic minutiae and anecdotes as he plowed steadily through patches of trees, vines and palms. I stopped and was immediately lost in a maze of gorgeous, overwhelming tropical biodiversity. I caught up with him again through echolocation and I think he hadn’t even noticed that he had been talking to himself for the past 15 minutes. When I unpacked my camera and tripod, his pace changed completely. 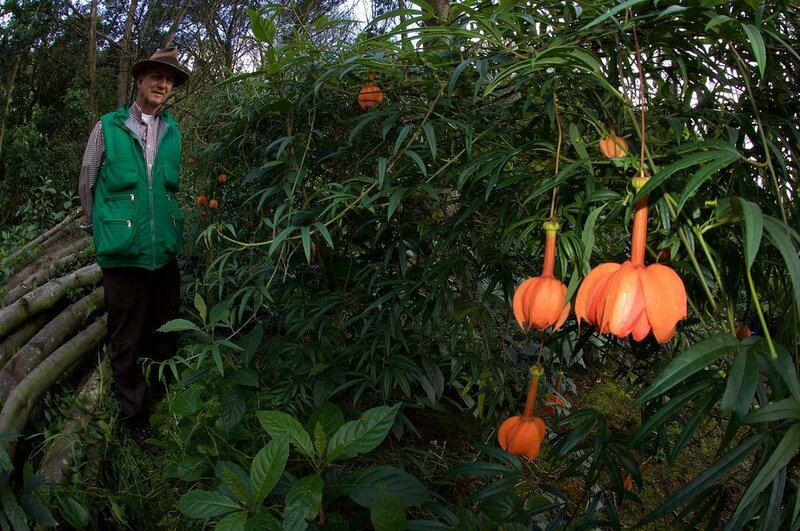 He proudly showed me many of his remarkable horticultural achievements, including his latest acquisition, the newly described Passiflora gustaviana, discovered in the western highlands of Colombia and dedicated to him. This is just one of the recent discoveries within this family, of which Colombia boasts 175 species, most of which (>80%) grow between 3,250-6,500’/1,000 - 2,000 m. So much for the myth of passion flower vines growing in tropical climates only! There are more species growing under wet temperate conditions than in lowland rainforest environments. Although several species can tolerate hard frost, they don’t look particularly good afterwards. But normally recover when trimmed back. The nemesis of passion vines in tropical and subtropical America, a Heliconiid butterfly larva relaxing after lunch. Many passion flowers in cultivation are grown for their fruit. Among these, Passiflora edulis is by far the best-known and economically most important species of passion vines, with its two botanical forms. P. edulis f. flavicarpa, a.k.a. Maracuja, the name adopted in its country of origin Brazil. It is known around the world under the names of yellow passion fruit, Maracuyá, Parchita, Chinola and Calala, and the purple form P. edulis f. edulis, originating from higher latitudes in South America, that is naturally confined to cooler climates. It is locally known by its indigenous name Gulupa, and it bears small, dark purple fruit with an intense aroma, less acidic than Maracuyá and with a more complex taste. More than 80 Passiflora species are known to produce edible fruit. From the tiny, grape-shaped P. adenopoda to the huge P. quadrangularis, they all share a mix of citric, vanilla and berry flavors in different proportions. The more acidic ones are often mixed with milk and sugar rather than water, as they curdle the milk in the blender, resulting in a thickened beverage, very popular in Colombia. These fruits are called Curuba de Castilla and Curuba India and look more like cucumbers than passion fruit. Gustavo Morales hand-pollinating a Passiflora parritae flower. Domesticated passion fruit readily hybridize within their wild relatives, a fact that is used to tweak the characteristics of many cultivars. Be it as ornamentals to enhance their flower form and colors, or for fruit production to increase sugar contents or fruit size, the live reference collections are an invaluable tool. They are also the last chance of survival for a few vanishing species, currently know only from a few wild specimens (or none at all!) with only a handful in cultivation. Passiflora parritae by F. X. Matis (Image: Archivo Real Jardín Botánico, Madrid, Spain). Such is the case of Passiflora parritae, discovered in the early 1800s, described by Maxwell Masters in 1882 and now thought to be nearly extinct in the wild. The original habitat was clear cut almost a century ago and what remains are a few patches of Andean forest, encroached by pastures, eucalyptus, acacias and pine trees. A large specimen originally from Vereda Libano, Caldas grew for many years in the San Francisco Botanical Garden in Golden Gate Park, and for quite some time it was believed to be the only surviving plant. While this specimen died a few years back, there are many cutting-grown propagations of it surviving in the SF Bay Area of central California, in other parts of the U.S. and in collections in the UK. Gustavo grows and conserves several hedges of this species using the same approach as for most of these plants. He drives two six to eight-foot stakes into ground, about 25-30’/8-9 m apart. At the base of each stake he plants two to three young plants, unrelated to the plants from the opposite stake. They climb the cable and run along the stretched lines, sometimes growing over 20”/50 cm per day, until they intertwine each other, forming a dense canopy of leaves. Passiflora parrittae is a mixed blessing as a rare garden pet. On the upside, it produces huge, fabulous bright orange flowers that resemble lit Chinese lanterns when the sun shines through them. Although its fruit are nothing in particular taste-wise, it is a spectacular plant when in bloom. But be careful; if cultivated properly in the right environment, given space and left unchecked, it will take over your house. “You see”, he concluded. “Somebody has to grow them”. We walked on for another five minutes. He stopped at the edge of his property, and there grew a vine, stretching its tendrils over the barbed wire fence. A couple of Ziplock bags, hung from the wire, protecting a few fertilized flowers from squirrels and bats. Next year’s precious crop of Passiflora cremasthanta was well on its way. This is a large, widely-distributed genus with an abundance of showy-flowered species. Almost a third of this group’s total diversity in Colombia are strict political endemics (58 species) and three were once considered extinct. As the security situation in this country slowly moves towards a peaceful resolution after decades of conflict, these numbers will almost certainly change as botanists inventory regions where armed insurgents did not allow access for many years. I think that something remarkable occurred in April 2004, when a team of researchers led by John Ocampo scanned the slopes of the Magdalena river for days, searching for the enigmatic Passiflora mariquitensis. This rare passion flower was known only from the 1784 painting of it by Francisco Xavier Matis. The illustrator of José Celestino Mutis’ volume on passion vines and begonias (Vol. XXVII) had done such a good job, that 234 years later they were able to identify flowers on the few surviving plants that they finally found persisting along the steep escarpments of the river. Their discovery brought this long-lost, critically endangered species back to life from a beautiful old watercolor. “So, have you gotten your hands on seed of this species yet?”, I asked “El Profesor”.